Sandwich #3 for sandwich week = tuna salad with a twist. It’s an open-faced sandwich so that you can see all of the goodness. Just work with me here. It’s not a secret that I love Asian flavors. (Proof is here, here, here, here, and here.) It’s a real deal. It rivals my love for Mexican food. Especially when it is this stinking easy! I just needed a quick meal last week and I remembered Julie posting this Thai Tuna Salad. I knew that I had canned tuna in the cabinet so I pulled it up but had only a few of the same ingredients. So I improvised. My improvisation included this wasabi mayonnaise (which is amazing, if you like wasabi), some honey, some Sriracha, lots of ginger and sesame seeds and for some added crunch, chopped water chestnuts. If you like quick, flavorful and (mostly) healthy meal ideas, this one is for you. I have made it twice already. The beauty is that these are ingredients that are always on hand in my kitchen. And it can be easily doubled or tripled, and it’s not heavy like a lot of “salad” type sandwiches. This one is beyond worth a try, and do some improvising of your own too! 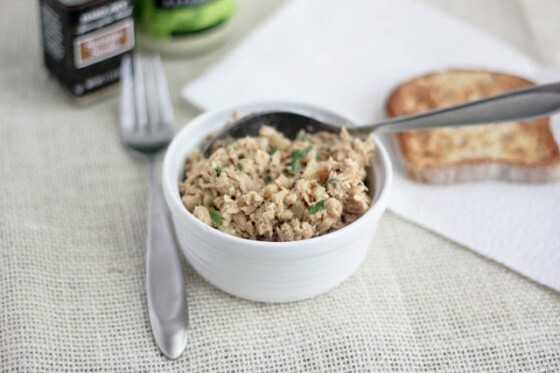 Simple tuna salad with Asian flavors like wasabi, seasme, ginger and soy sauce. Quick and simple and hugely flavorful. In a medium bowl, break up the tuna with a fork. Add the mayonnaise, sesame oil, lemon juice, water chestnuts, soy sauce, ginger, half of the sesame seeds, honey, chives, garlic, pepper and sriracha. And stir until combined. Serve on sandwich bread and garnish with additional sesame seeds. If you can't find wasabi mayonnaise, simply use regular mayo, Greek yogurt or sour cream and add a small amount of wasabi to taste. I also ate this with a spoon out of the bowl and it was fantastic. I think it would be perfect for serving with veggies, in lettuce wraps, on tortillas or with crackers or pita chips. The crunch is my favorite! Thanks for the inspiration! I just posted a tuna recipe too! We’re so cool. I love open sandwiches like these because I feel like I can justify eating two of them 😉 Another great sandwich! I looove Tuna sandwiches…and sesame seeds!! This sounds crunchy and yummy!! Asian is my rival for mexican too! One of my all time favorite restaurants is in Phoenix its mexican with an asian spin….hmmm can’t remember the name of it. That sounds so interesting! I would love to give it a try. I’ve made Julie’s thai salad before too and didn’t think it could get much better but wasabi mayo sounds utterly amazing! It is so good, if you like wasabi, you’ll love it! Mmmm…I think it’s safe to say I love pretty much anything with wasabi. These look delish! Me too…we should have a sushi date! I’m a sucker for asian flavors, too. It’s actually the sesame oil that turns me into a panting fool. I think I would really like this! Me too, Sally! I love the stuff! It’s all about the crunch, I love it! The Sandwich Queen is at it again…looks great! Can you say yum? I could so go for this right now for lunch. Awesome! I am adding tuna to my grocery list. Also, I recently mashed up 1/2 an avocado into my tuna salad instead of mayo. Outstanding. 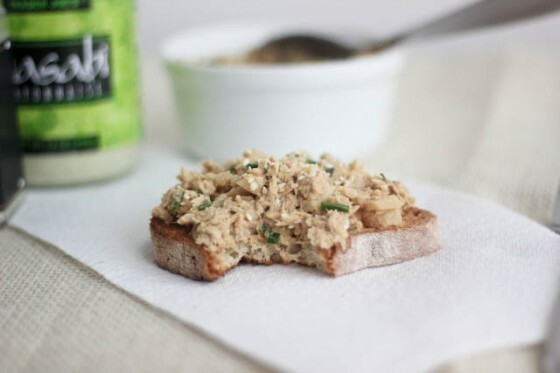 Avocado + tuna is a brilliant idea! The sandwiches just keep getting better, Cassie! This looks so awesome….such great flavors. Love the water chestnuts, ginger & sriracha. Can’t wait to see what’s up next!! I love that you added Wasabi to your tuna sandwich. So brilliant. Honestly my favorite addition is the garlic. I always keep my tuna pretty basic but that’s a fun twist. I am 100% on board with this sandwich. And by that, I mean I want one immediately! I’ve never tried an Asian tuna salad, but I’m loving the sound of yours!!! My next tuna sandwich will be this one…yummy! Oh my goodness, this sounds amazing! 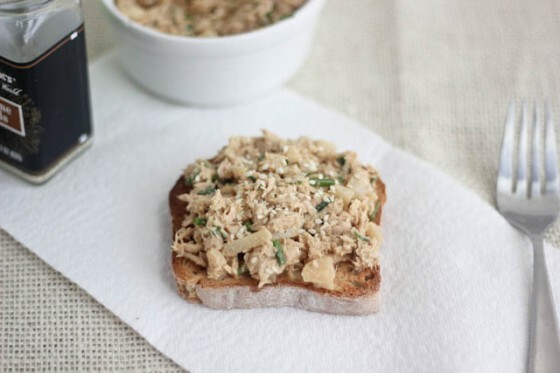 I’m all about tuna sandwiches lately and I can’t wait to try yours. YUM! Mmmm, I’ll have to make this one day when Carl isn’t home, tuna is the one food he hates with undying passion, but I love a good tuna sandwich, and this looks totally worth putting up with his complaints about the smell in the house! You had me at wasabi mayo!! Delish! ahhh LOVE the Asian flavors! I would have never thought of sprucing my tuna up like this. Thanks so much for looking it up, I’m going to check it out. I love the concept! Haha, I love Mexican and Asian flavors too – they’re some of the things we cook most at our house! 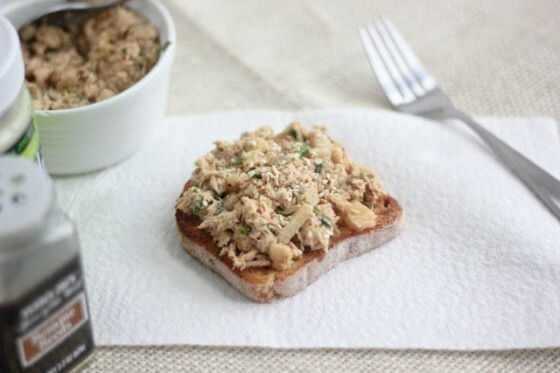 I have been looking for a way to use up a can of tuna from my pantry, this just might be the answer. It sounds great! !